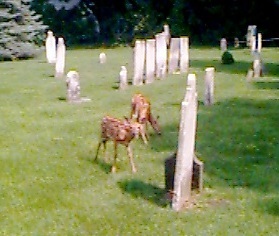 This cemetery is located at the intersection of South Main Street, Stone Road, Mendon Center Road and Mendon Road in the Town of Pittsford, New York. An eight page list made about 1910 by Anah B. Yates. A four page list made about 1928 by an unknown person. A seven page list made in 1940 by members of the Church of Jesus Christ of Latter Day Saints. A fourteen page list made in 1984 by Lois C. Wilson. Each of these lists had some inscriptions that were not in the other lists. All were combined into one master list and then a visit was made to the cemetery in Aug. 2000 by Richard T. Halsey to make corrections. When a tombstone inscription was not found; it is indicated. [Captain] Samuel; b 1765; d [Nov. 10], 1840 [Note: a historical marker states he was issued the first patent in the US on July 31, 1790. Marker was removed about 2005 as the information was found to be incorrect.] 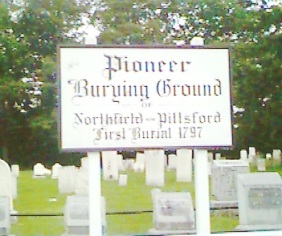 Samuel moved to Pittsford, NY in 1810. Rachel Ide, wife of Glover; d Aug. 16, 1808 in her 78th yr.
William H., son of John & Hope; d July 1, 1824 aged 14 wks. Gustav; d Apr. 1890 in his 23rd yr.
infant child of Eber & Eliza; d March 6, 1842 aged 3 wks. Zachariah, emigrated from Lincolnshire, Eng. in 1802; d Aug. 20, 1821 in his 76th yr.
Celinda, consort of Harry; Oct. 9, 1822 in her 26th yr.